Our club is active all year, with members participating in social and technical events, including car shows, track days, auto crosses, road tours, parades, and high school homecomings. Our activities include both daily and weekend events. Socially, we golf, bowl and go to the movies together. Our road tours take fun routes to locations and events in Oregon and Washington. We have brunches, lunches, snacks, chili cookoffs and potlucks together -- we do like to eat!!! One of our favorite events every summer is the Miss Oregon Pageant, where we carry the contestants during the Pageant’s parade in Seaside Oregon. We support the Oregon Food Bank and Guide Dogs for the Blind. We have an annual drive to collect stuffed animals for the Clackamas County Sheriff Department to give to traumatized children. 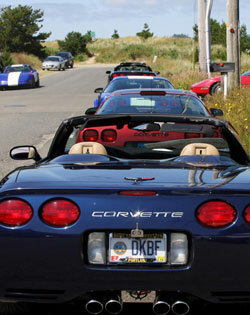 To become a member of RCC, you must be over 21 years of age, own a Corvette and attend 2 regular RCC meetings (or one meeting and one club event). Our annual dues are $60.00 per household. If you would like more information, email Jeannette Carner. Ready to join? Download the Membership Application. Copyright © 2013-2016 Rose City Corvettes. Legal Information All Rights Reserved.